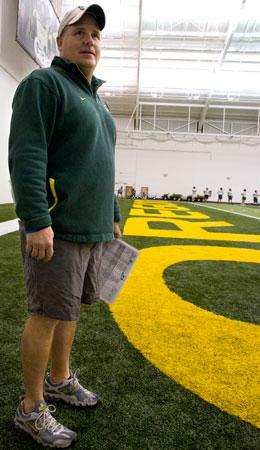 We’ve written about our favorite football coach, Chip Kelly of the Oregon Ducks. Kelly has been a paragon of coaching in his first-year on the job, leading the Ducks last year to a 10-3 record and their first Pac 10 championship since 1995. He did this while insisting on good citizenship from his players, even suspending his top running back for nine games for sucker punching an opposing player after the Ducks’ opening game loss. Duck fans were hopeful of an even better 2010, with most of last year’s stars returning, led by Heisman Trophy candidate, quarterback Jeremiah Masoli, and running back LaMichael James, who rushed for 1546 yards as a freshman last year. This could be the Ducks’ chance at a national championship, even. Not so much, anymore. Kelly suspended James, another of the team’s offensive stars, and top placekicker Rob Beard, both of whom pled guilty to misdemeanor physical harassment. They’ll both sit out at least next season’s opening game, with the proviso that they can play after that if they adhere to the guidelines Kelly puts forward. But the big deal was the suspension of Masoli for the entire 2010 season after Masoli pled guilty to second degree burglary from a campus fraternity house. The suspension of the Ducks sensational quarterback greatly diminishes, if not ends, their chance to repeat as Pac 10—let alone national—champions. The actions that our players take when they’re in the community and not on the football field or in the classroom, are just as important to us. How they behave as student-athletes here, it’s not just on the field. And if they cross that line, I’ve said all along there will be a punishment that will go along with that. Let other top football schools put winning above sportsmanship and citizenship: let Florida Gators coach Urban Meyer, suspend a top player for one half a game for attempting to gouge out the eye of an opponent; and let USC showcase O. J. Simpson’s Heisman trophy in a place of honor at the Los Angeles Memorial Coliseum. To Oregon’s Kelly honor comes first. Let’s hope winning comes too. This entry was posted on March 14, 2010 at 10:33 pm and is filed under Ethics-general, Sports. You can follow any responses to this entry through the RSS 2.0 feed. You can leave a response, or trackback from your own site.